Try to remember that restaurant, where you were torn between the choice of a plain very-low-calorie all-natural cranberry mousse and pear frozen yogurt? Yes, the same one, where instead you went for a slice of a pumpkin pecan cheesecake with some fancy schmancy whiskey sauce on a side. Oi. You chuckle, amused at your weight watching and budget monitoring plans, ruthlessly crashed by that charming freckled waiter with a dazzling smile. His tempting description of the numerous pastry chef awards won by that exact cake, and the amazing photo in the menu simply has beaten you cold. Still, you feel good about that cake, keep thinking fond thoughts about that mouth-watering culinary perfection and wonder when to pay a second visit… Congratulations! You’ve experienced a perfectly upsell with an emphasis on the word ‘perfect’. There’s nothing inherently bad in upselling itself, it’s not a trick, attempt to rob the customer blind or putting to practice the desire to sell a worthless piece of junk for a ridiculous amount of money. It’s a marketing technique, which is so popular among some companies, that they are even willing to sell some product or services at a loss in the hope of a future upsell. Implementing upselling strategy in your e-store would allow you to influence decision-making, but not for all customers. Therefore, it is necessary to carefully approach the introduction of this technique, as the mistakes can bring down to a minimum all the hard-won advantages. 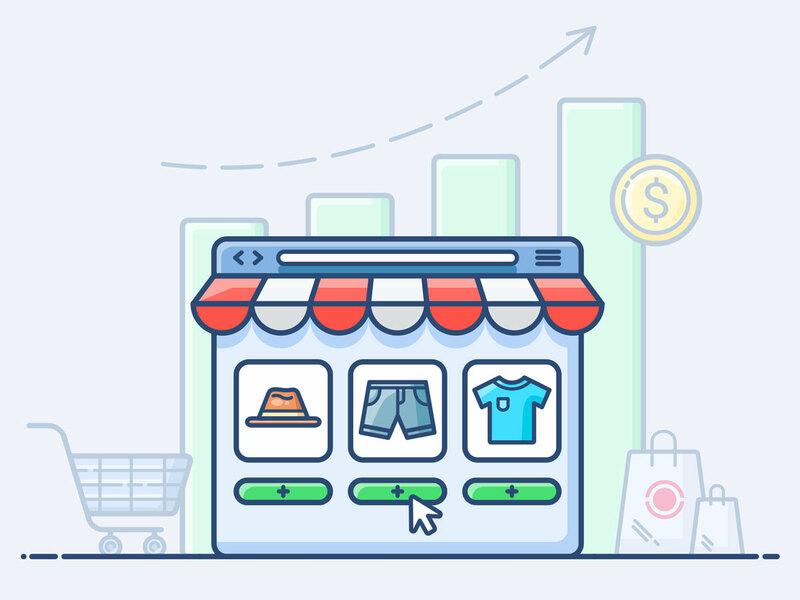 That’s where a Shopify app can shoulder some of the responsibilities and become something akin to that whispering devil of a waiter, that we spoke at the beginning. Minus the freckles, there are many applications at Shopify, that can surpass even such exemplary employee, and we’ve compiled a list of those we liked the best. Let’s look at them more closely. Encourage your customers to spend just a little bit more with this very popular app with a high rating. Bold Upsell suggests additional and complementary products for what your client orders and facilitates the searching for the desired items. In case they just didn’t realize that they need that extra purchase, Bold Upsell will convince them. And it’s a very smart app too, almost futuristically so, thanks to integration with Bold Brain, which enables the gathering and processing a massive amount of data about the most popular products in your store. Then it’s using collected info to create meaningful complementary and cross-sells offers which would be impossible to do manually. Since these offers are based on the real data, the resulting conversion is significant. 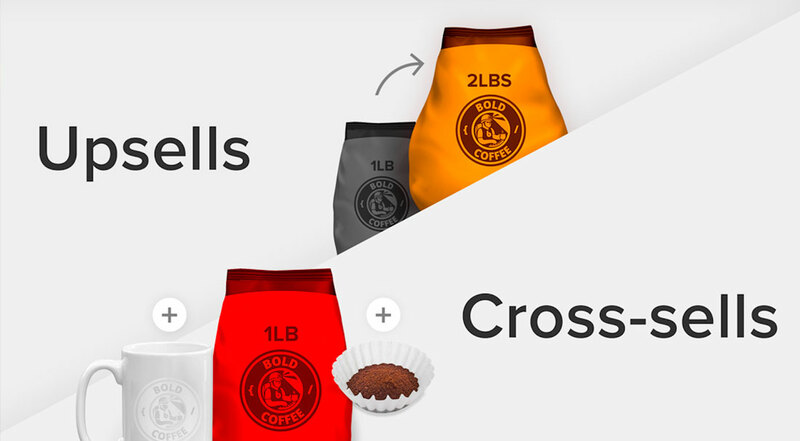 Bold Upsell is a jack of all trades, boasting the ability to do many things besides upselling, including very neat ‘Duplicate and Hide’ feature, which duplicates a chosen product, sets a lower price for it and visually hides it on the storefront. This way customers do not see it on the storefront and you can use it in upsell offers. With this app your upselling doesn’t stop after the checkout – you can with a single click add upsell offers to the ‘thank you’ page and strengthen the impact with a countdown timer! In the offline world, where person-to-person kind of marketing is practiced everywhere with sales assistants, managers and the like, the upsell is easily done by convincing ‘sales talk’. Just think of the phrase ‘you want fries with that’ and there, the simple but nonetheless effective power of upselling in action. SMAR7 bundle does the ‘sales talking’ to your customers perfectly, taking it to the sales pitch level, helping you instantly to boost sales with an easy and intuitive interface. This app watches like a hawk everything that customers are putting in their cart, takes notice of the device they’re using, and employs the gathered data to make very accurate suggestions. Among other provided advantages we want to point out the gamification approach, which everyone likes since it makes everything plain entertaining and fun. Engaging the customer can be the shortest path to their wallet, as well as strengthening their loyalty and ensuring their return. SMAR7 bundle is mobile friendly too, displaying without a glitch on all kinds of devices and on all types of screen. This convenient app is well versed in both cross-selling and up-selling strategies and is straightforward to set up and very easy to use. It’s completely free and a good psychologist in the respect that it knows the significance of seeing products in the shopping cart. Why that’s the announcement of a person ready to buy something! 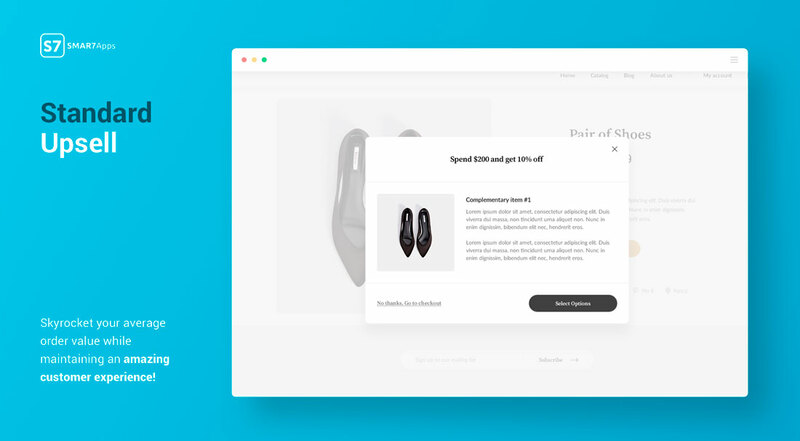 Without further ado Cart Convert creates groups of related products to recommend, and assign to it special spend threshold value. Then, when a customer’s shopping basket equals or exceeds a specified amount, it displays for them a recommendation list. With Cart Convert, you can create as many carts offers as you like with different products and different thresholds. After a client reaches an assigned value, Cart Offers will obligingly show all groups of products available to them. Besides being a qualified counselor, this app is also a deft hand at statistics and can present you a lot of useful data, including the number of recommendations shown to the client, your earnings from the app, and the conversion rate for presented offers. Not only that, but you’ll also get to know how many products were added to the cart in accordance with Cart Convert advice, and how much you can earn from these offers. Everybody knows that ‘practice makes perfect’ and this smart app is no exception, letting you test the efficiency of your offers for different customers and other variables with ‘Offer Simulator’ feature. It allows you to tailor your offers and add corrections based on the gathered data before the launch, not after. 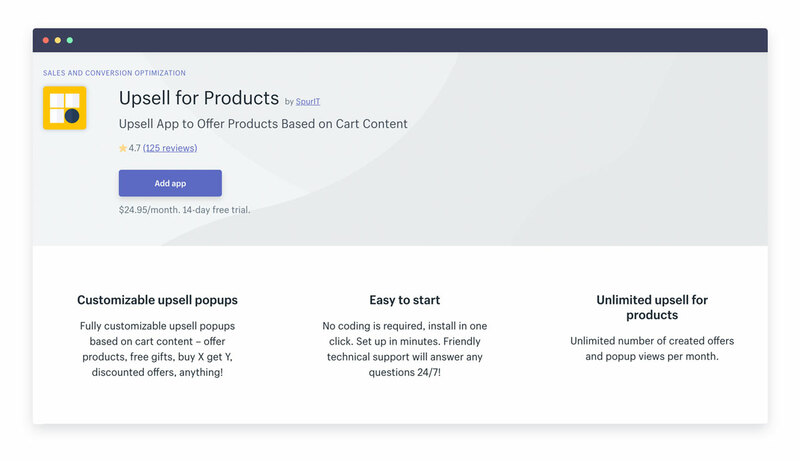 After stating all this, the support of offer text customization and the ability to place your offers anywhere, from the product page to the checkout page, look almost overwhelming, right? Yeah, it’s THAT good. We like to read reviews and comments not just because those provide a very clear indication whether the app is liked, and learn whys in case it isn’t, but also for some very meaningful insights. How do you like the comment ‘2 min to install, 1 min to update and accurate suggestions’? Not sure about such high praise? Let’s dissect this app and see if it’s deserved. Today shoppers are surrounded with a lot of choices and many distractions, making gaining attention and trust by putting the right products in front of each shopper very important. 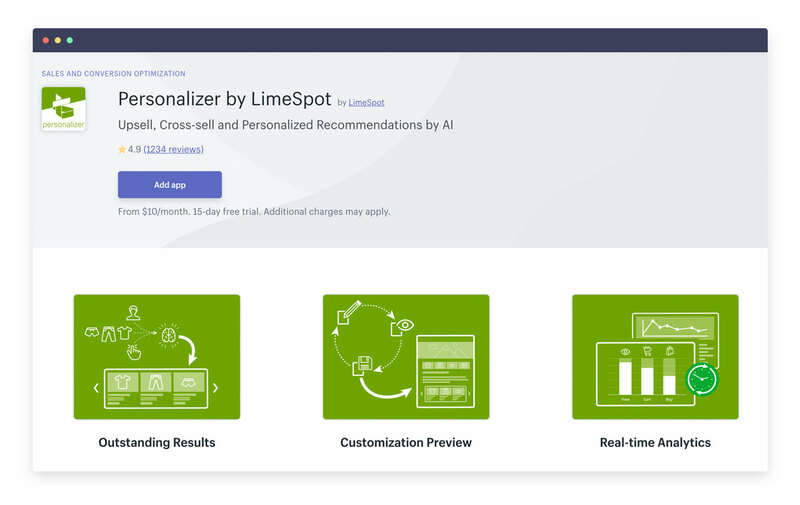 Personalizer uses advanced algorithms mixed with behavioral and trend analysis to make the recommendation precise and actionable. Using Intelligent Recommendation Boxes, it showcases the specific products to specific customers, maximizing the likelihood of buying. You can manage the process using a very convenient dashboard, where you can track how your app is doing. Here you also get complete customization of these boxes and can change its appearance either to match it with your brand or make the most of contrasting colors and such. Besides the look, you’re in control of its location as well and can showcase related products on every page of your store. You can preview all the changes as well, before going live. Need more convincing? Easy as pie, Personalizer also boasts the support of manual and automatic curation, responsive design for mobile devices, detailed analytics and reporting, easy integration… Oh, you think about downloading it? Well, we leave you to ‘yes’ answer to that question. This app is very easy to setup, like one click and you ready, provides a powerful analytics tool, enabling you to track domain statistics, evaluates the overall efficiency and makes the actionable recommendations about follow-ups, works with any theme, fully customizable… Besides that, it offers complete gateway optimization, works on a site in any language and, of course, mobile-friendly. 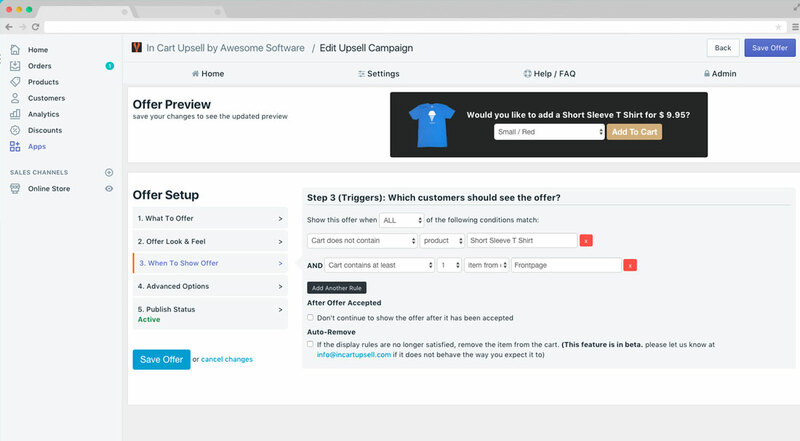 All in all, a very reliable solution for effective implementation of an upsell campaign in your store. Discounted Upsells boasts mobile and desktop optimized design and it’s easy to install with no coding skills required. It gives clients a little push towards making bulk purchases and at the same time increases conversion. How? You have a choice between using a percentile discount or applying a flat-rate discount, whichever you think is more appropriate. You can also configure automatic choice of collection for upselling and cross-selling or you can base the choice on what the customer has already put into his cart. 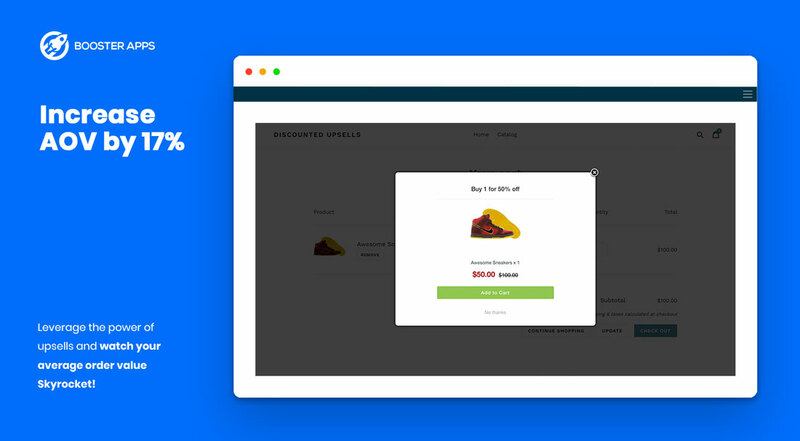 Discounted Upsells supports updating the offers in real-time mode. 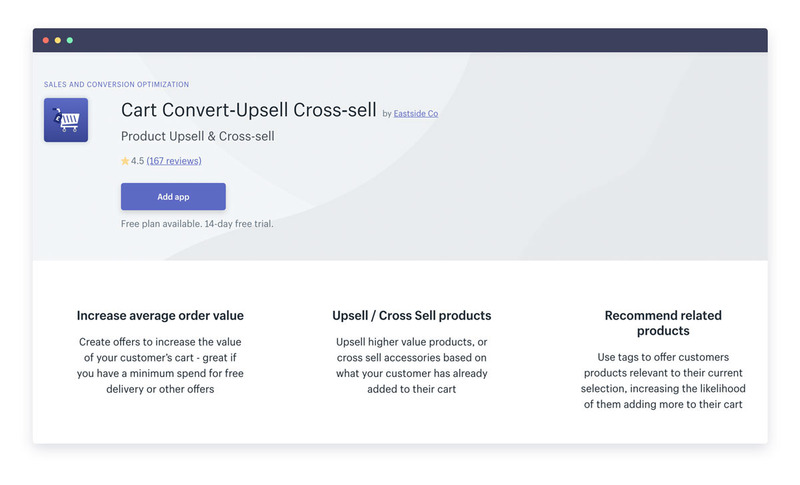 It also enables you to use a lot of popular upsell and cross-sell templates, including BOGO, ‘Buy two, get 50% off of another one’ and others, making all your offers fully customizable and very easy to create. It also integrates with all Shopify sales channels and inventory management apps. Upselling is the lifeblood of many business models. Every business is different, and every customer is unique, but there are tactics, that are sure to generate effective upsells for your business. We offer you apps, that will seamlessly and effectively build upsells into your business from the very beginning, and make marketing campaign extremely easy, automating most tedious tasks for you. You’ll just have to come up with some phrases, that would give people a little nudge towards buying more, and at the same time make them feel good. Because the important thing about upselling is not higher profits. It’s retaining the customer longer. It’s gaining the popularity. It’s making them more loyal. And we’re positive that among these nine apps you’ll find that one, which, coupled with your superior products and mad strategic skills, will greatly please your shoppers.